At the outset, I apologize for the self-referential nature of this piece, because I’m too lazy to present this info in a manner other than the tweets I sent out this morning. If you want good, organized data in fancy chart form, check out Mike Murphy (@DigDeepBSB) on twitter, who does an incredible job herding the cats that are women pro hockey stats. And also is really good at herding cats, probably. First, I’ve made a a point of discussing shot differentials for the Beauts in my Beauts Essentials game previews. Historically, the team is known for giving up a lot of shots to their opponents. Last year’s Isobel Cup superhero Brianne McLaughlin stopped an incredible 60(!) shots in the final to defeat Boston. That’s two games worth of shots in the average NWHL game this season. Things are bad again this year, as Buffalo is giving up five more shots per game than they are taking. Goaltender Amanda Leveille has faced more shots and made more saves than any other netminder in the league this season. As you can see from the tweet below, that is what they call in the business a ‘Big Deal.’ The standings through six games reflect exactly the teams who take the most shots per game, in descending order. Anomaly? Maybe. It’s a small sample size. But it’s also a reasonable, logical assessment. With team shooting percentages generally floating around 10-12 percent, just eight more shots per game can be one goal, from a statistical standpoint. Where is the deficit coming from? As a team, Buffalo’s shot rate is 1.11 less per game that last season, where they took the fewest shots of any team in the league. Even then, the team was getting shot support from the backend that they are not getting this year. Below is a breakdown of the top three defenders in shots per game last season versus this season. As you can see, there is a huge gap between Megan Bozek’s 4.0 and Sarah Edney’s 1.83. It’s an important component to the story of the Beauts’ season so far – the role of the defense in the offensive zone has diminished greatly. There are a couple of things to note. First, Buffalo has played most of the year with a power play unit that features four forwards. 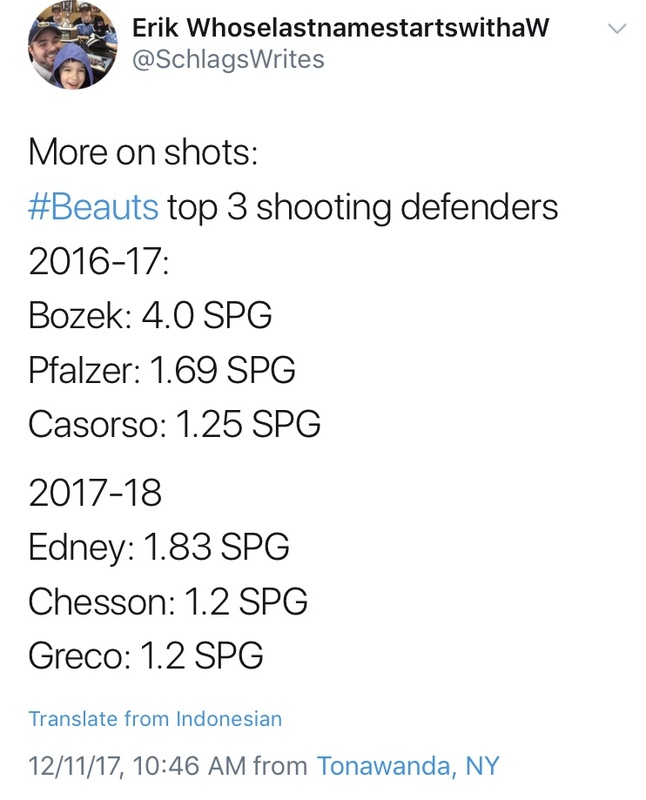 That wasn’t always the case last season, though I am certain a lot of Bozek’s shots came with the player advantage. Second, the team has played the undefeated Riveters three times. Surely, this will skew the numbers a bit. 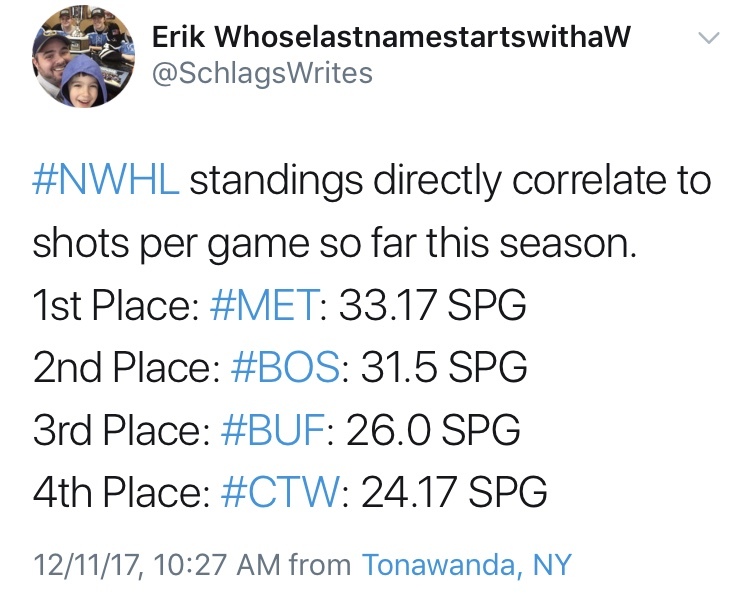 There is no team in the NWHL that is as good at controlling the pace than the Riveters, and it has been Buffalo’s misfortune to have played them in half of their first six games. It would appear, however, that the Beauts are very much missing the Bozek and Emily Pfalzer, who are committed to the US national team in preparation for the Olympics. While the team did a good job bringing in solid hockey players like Edney to balance the loss, there is no replacing two of the world’s most dynamic defenders. 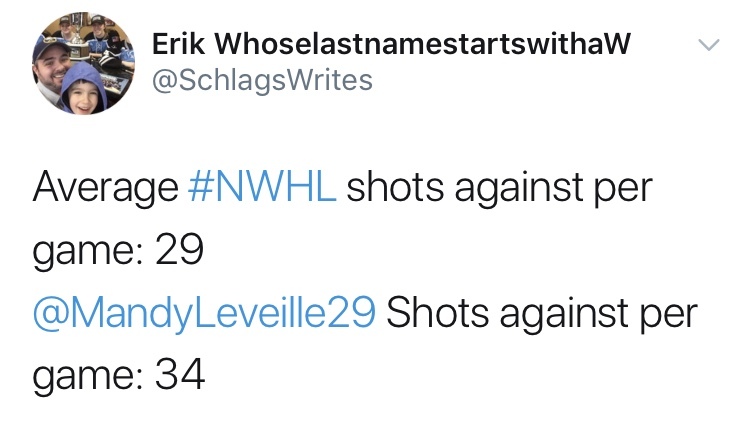 Leveille is facing 34 shots a night, and the Beauts are generating only 26. It will be interesting to see how coaches Ric Seiling and Craig Muni deal with this deficit. It is something that the pair must address in the next few weeks, lest the team lose even more ground as the season heads toward the halfway point. Of course, 716 Sports Podcast will have your Beauts Essentials later this week, and these points will be reiterated. Come join us at HarborCenter as the team looks to put some space between themselves and the Connecticut Whale. If you can’t make it to the game, be sure to tune in to the Twitter Game of the Week, with Jeff Boyd, Justen Ehrig, and I bringing you action from the ice.